the annual celebration that kicks off Bike Month, promotes cycling as a viable and healthy option for commuting to work. We conclude our rides into downtown Brampton at Garden Square (Main & Queen) beside Rose Theatre at 7:30am. Have you ever wanted to bike to work and need some help to get started? Are you a regular commuter cyclist? 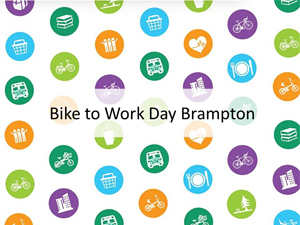 No matter which type of cyclist, you are invited to register for free Bike to Work Day Brampton. Free breakfast will be provided complements of local businesses. Opportunities to win prizes! City of Brampton, Brampton Downtown Business Improvement Area, Region of Peel & BikeBrampton are pleased to co-host this event with partners: Brampton Transit and Brampton Cycling Advisory Committee. We have an exciting line-up of exhibitors including Brampton Cyclepath and Community Bike Centre. You can enjoy festivities until 9:00am. – It’s free! Let us know you are coming! Join one of our free organized rides, led by leaders from BikeBrampton and Brampton Cycling Advisory Committee. These optional rides give less experienced individuals a great opportunity to ride with more confident cyclists. It’s a fun and sociable way for cyclists of all abilities to meet and ride to our Breakfast event together! “Like” our Facebook page for details. Click “Interested” for rides you want to try, so that you’ll be notified of any updates. Register on Eventbrite for the ride you have selected. Ride departs at 6:50, and expected to take about 40 minutes. Ride departs at 6:45, and expected to take about 45 minutes.